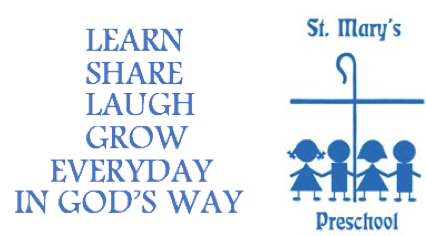 St. Mary’s Preschool is a Diocesan school under the direction of the Office of Catholic Schools and the guidelines for the Virginia Catholic Education Association’s early childhood programs. We are licensed by the Commonwealth of Virginia and meet strict standards for health and safety. Our program interprets the general goals of early childhood education as being primarily the development of the whole child and we are committed to offering opportunities for balanced growth in all areas: social, emotional, cognitive, physical, creative, and spiritual. We are a ministry to young families, working closely with the parents as our partners in education, and are dedicated to providing a quality Catholic preschool program. We look to our parish community as our sponsors and benefactors to meet the needs of the community in a Christ-centered environment. A Catholic preschool develops a love of Jesus and knowledge of the presence of God in the lives of the children it serves. Foundations are laid in the Catholic faith as children experience positive interaction with Christian adult role models. We recognize each child as a unique gift from God. Our curriculum incorporates the liturgical calendar and monthly themes that include elements of religious education appropriate for preschoolers. All of our classes attend monthly adoration of the Blessed Sacrament and our 4 year old classes attend Mass the first Friday of each month. St. Mary’s Preschool will give young children a wonderful opportunity to grow and explore. It will provide a loving, secure environment in which children will develop spiritually, physically, cognitively, and socially. Our goals are to provide healthy Catholic values, a positive self-image, and a spirit of sharing through a cooperative relationship with our Preschool families. St. Mary’s Preschool admits students of any race, color, national, or ethnic origin. Play is the most developmentally appropriate and productive avenue for young children’s learning. Play has all the characteristics of a complete educational process. It secures concentration for a great length of time. It develops initiative, imagination and interest. There is complete emotional involvement. Play is inherently individual and has no pre-determined expectations. There can be no “failure” in play. Each child is free to succeed at self-chosen tasks, and this success leads to feelings of competence, self-worth, and the willingness to try new things. The Commonwealth of Virginia and the Fairfax County Health Department require that health forms with current immunizations be submitted to us at the beginning of each school year. All preschoolers must be “potty trained” before entering our program.